← The Best Video Camera App for iOS, @FilMicPro, just got a whole lot better. A little preamble if you will humour me……I’ve been an Avid User / Trainer for the last 7 years and have gone to great lengths to avoid FinalCut and Premier as alternative editors. After furore and backlash after the launch of FCPx I felt quietly vindicated that I had never bothered to dip my toe outside the Avid waters, however I was recently on a training assignment and in spite of the fact that I had billed Avid Media Composer training into the programme I couldn’t get access to MC software – all that was available was FCPx. So, I somewhat reluctantly, bought and downloaded FCPx on my MacBookAir and spent a weekend playing with it and learning some of its features. I have to say I was really quite blown away – I expected the worst after reading all the damning reviews about it being iMovieX not FCP etc etc – and to some extent I understand why that criticism was levelled against it (the interface after all IS an advanced iMovie UI) but it is actually an incredibly powerful piece of editing software and for the price tag its worth every single cent. In my honest opinion it really IS a pro version of iMovie aimed at members of the public who want to move into more professional editing, but if you can open your mind to the non-traditional layout (no preview / programme) and UI its actually a fantastic and powerful program. So with that in mind I showed my group of trainees (who had no previous shoot/edit experience) how to import content from Canon 7D DSLRs, import audio from an iPhone using Rode Record to record off camera Audio, and then sync the two in the App – which is SO easy even they were impressed! We cut sequences, did a little colour correction, recorded voiceover, audio mixed and exported (or should I say SHARED our finished edits. The entire process was really quite painless and the group were really impressed with the usability of FCPx (as was I) it really is a fantastic entry point for someone starting in professional video editing. I’m not dramatically saying I’ll be abandoning Avid any time soon (Im too used to the pro interface) but nonetheless I really regret not having tried FCP sooner. These Apps are not the same so I am not comparing them, just highlighting them for you to decide which you prefer, if not both! 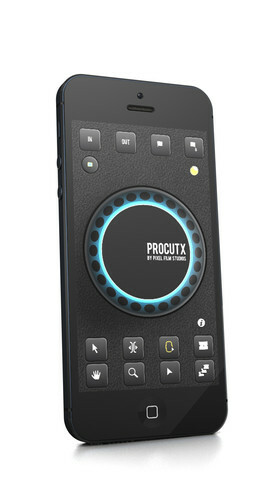 This App is designed exclusively for FinalCutProX and it costs $24.99 according to the Pixel Film Studio website. Strangely I downloaded it for free today, but maybe an In-App purchase will pop up at some point. The App is designed for iOS with a version for iPad and a version for iPhone also : View In iTunes you will also need to download the Server software for your MAC. Once you have downloaded the App on your iOS device you will need to register to get a link to download the server App – NOTE: there is no PC version of the server software. This App is the result of a successful Kickstarter crowdfunded project. 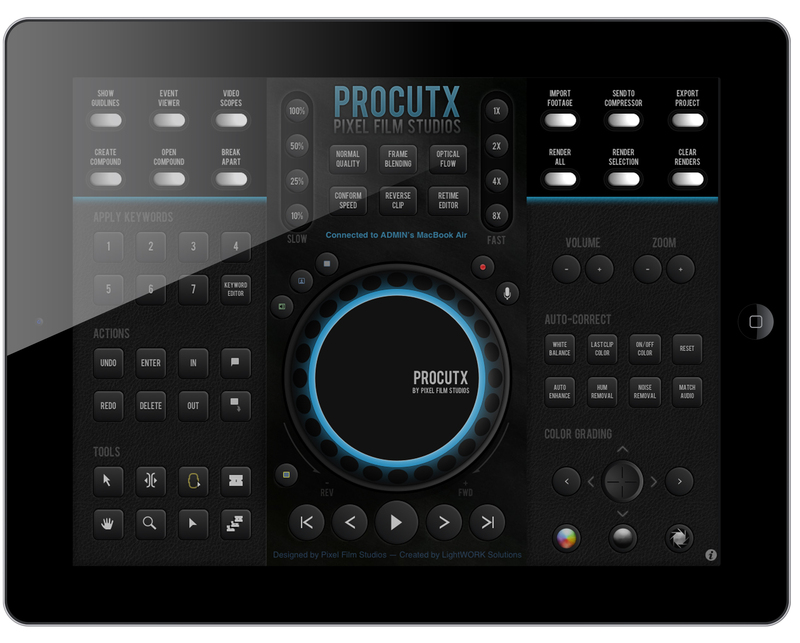 This App is for the iPad only but it is not just exclusively for FCPx – it currently also supports Adobe Premier Pro with Adobe Lightroom Developer, Lightroom Sorter and Mackie Controller Consoles on the way soon. The kickstarter page also mentioned a BlackMagic Davinci Resolve Console – which I hope will appear in the future. 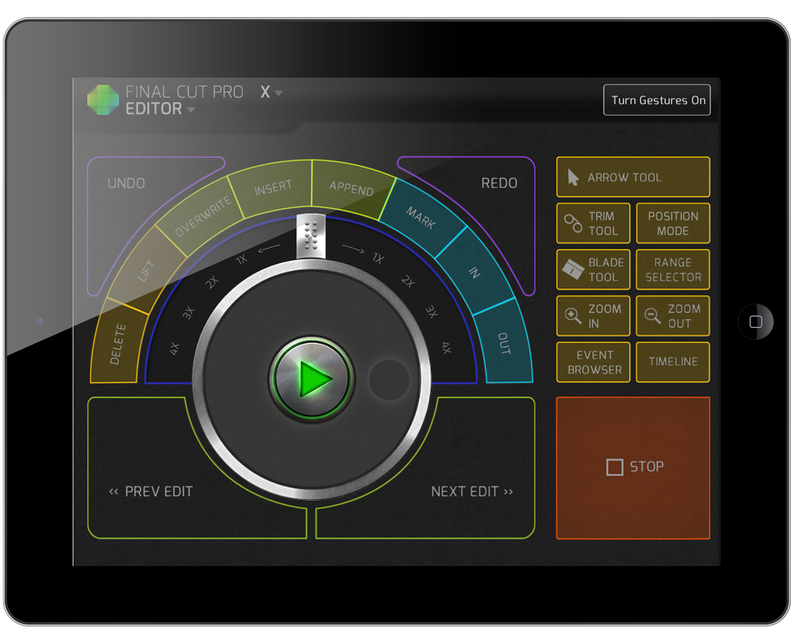 In fact it would be nothing short of fantastic if they could create a control console for the BlackMagic ATEM Vision mixers- @ctrl_console any thoughts guys??? The different Consoles have different prices depending on function. The App comes with a free Quicktime player controller for you to try but the FCPx and Premiere Editor consoles are €26.99 each. I really like the slick interface and responsiveness was really good over my wifi network. Let me know what you think. I am co founder of this software, which was released in the spring. It is very popular in Europe, but we have many difficulties to raise awareness in the United States. Hi Vincent, thanks for getting in touch (no pun intended) and for introducing us to your App. Ill give it a try in coming days and update the blog with a mention of it. As for “getting the word out there”….Please forgive me for saying this but your twitter account @ArcticWhiteness is effectively dormant, last post in March, no image, no header, and no proper description. A few minutes fixing that would help as I can add you to a #FF and try to get your name out there. I havent visited your FB page but your site is slick so Id suggest you update Twitter asap. Just a thought! This is handy information, as I’ve been thinking of getting a MacBook Air for travel. Can you tell me what the specs are on the one you used with FCPX? I wasn’t planning on doing heavy video editing with the Air. Mostly, I’d like to start pre-production whilst on the road — I’d like to be able to simply organize and keyword clips so when I return I just just plug the external drive with all the material on it into my main machine and start editing.